Posted in General Health & Wellness on November 15, 2012. Last modified on March 28, 2019. Read disclaimer. The soluble fiber in flax seed may help lower cholesterol levels and, perhaps, reduce our risk of developing atherosclerosis (hardening of the arteries). Dietary fiber also helps to satiate hunger, so we feel fuller faster -- which is important for anyone trying to lose or control weight. Because of it high oil content, ground flax seed can go rancid within a week when left at room temperature. To be safe, use a coffee grinder or food processor to grind the seeds as needed or only as much as you will use within a week or two and store this in an airtight container, away from light in the refrigerator or freezer. Whole flax seeds can be safely stored in the freezer for one year. While flax seed is generally considered to be a very safe food for most of us, women who are pregnant, are breastfeeding, or suffer from hormone-sensitive conditions may want to avoid eating flax seed since the lignans in flax seed are similar to the female hormone estrogen. 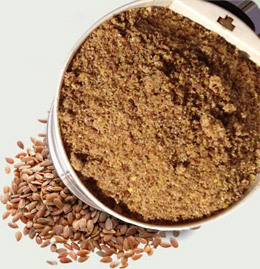 Diabetics should monitor blood sugar levels closely since flax seed may lower blood sugar levels. Also, since flax seed may slow blood clotting, people with bleeding disorders should exercise caution. And, people with gastrointestinal conditions may be at increased risk, just as they would be from eating other high fiber foods. Though rare, a severe allergic reaction can occur so it is advisable to start with less than a tablespoon.